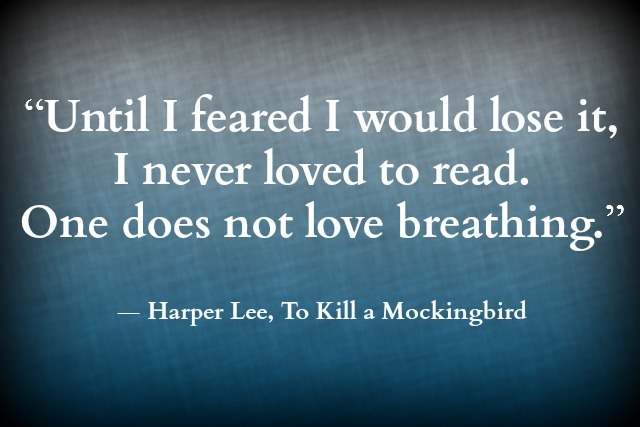 In honor of yesterday's marking of the 53rd anniversary of the publication of To Kill a Mockingbird by Harper Lee, we decided to choose one of our favorite quotes from the novel. If you somehow missed it in high school or if it has been a hot minute since you were in high school, To Kill a Mockingbird certainly has stood the test of time and definitely deserve a re-read! Scout's coming-of-age tale has it all, angst, murder, mystery, devotion, love, hate and redemption. If you haven't read it, don't let the fact that it is a literary classic intimidate you. To Kill a Mockingbird is infinitely accessible and touching. Read. It. Now!! Haven't listened to it yet but don't need to since I have done so many times in the past from the library and have read it many times in print form. Just decided I needed a copy of my own in audio as well as print.